I think this thread be closed and a whole new entry should be created in this blog for the occasion. After all, the 10th anniversary ARIA revival is quite a unique announcement. I heard the new anime will feature Ai as Akari's pupil. Aika will also tutor a new pupil, a nice girl from Sapporo. She looks a bit similar to how Aika-chan used to look when she was a pair. She uses oar number 39, but her oar is special, because it's in the shape of a leek. Originally she intended to join Orange Planet, but they didn't accept her due to poor singing skills. I think she would be a great candidate, because she already has a large sortiment of chibi, nendoroid and dayoo! expressions. I mean, anybody aspiring to become an undine on Aqua needs the most jarring super-deformed form imaginable, just to qualify as a pair. Oar number 39 is excellent, too: she can easily say "San-kyuu for riding on my gondola!" Maybe, just maybe, this would spark a new set of nice Aria figures. What does this page say? Is there anything new in it? Taken from the newest Amanchu chapter. BTW, the same URL will give you medium-quality japanese raws for Amanchu navigation 57, just replace the page numbers from 1 to 32. The ARIA uploader image collection is gone. Could it come back up? 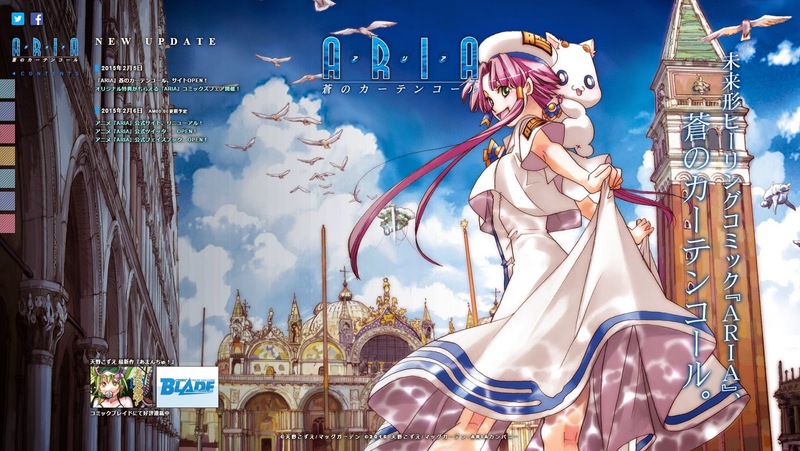 Could Choro-Club return for ARIA the Avvenire? Do you take ARIA seriously? They do. Photos were apparently taken at WS24 or WS25. Babelfish: 2015 exhibition decision: 3/21 from 3/22, held at Tokyo International Exhibition Center, Japan's largest animation event Anime Japan by 2015, decided to join! Shochiku booth (East Hall 2, A24) selling anime new toy ARIA! Supposedly an ARIA the Avvenire preview music video will be attached to the "Tamayura Graduation Photo" episode (or OVA? ), which debuts on 04 April 2015. Apparently the ARIA landscape photos of 26/9/2014 (possibly those published alongside the Amanchu! manga or the artbook?) are part of the new the Aria the Avvenire anime storyline? Thanks for spotting it! So the story takes place after Ai has joined Aria company? But what will this be, a 2-cour series, an OVA or a movie? And they list Tomoko Kawakami as Athena, which is a bit suprising, given the circumstances. It would be so nice to get Amanchu scanlations up to date, before Aria the Avvenire arrives on Sept 26. At Teatimes pace, I'm sure your grandchildren will be able to enjoy the latest issue! > At Teatimes pace, I'm sure your grandchildren will be able to enjoy the latest issue! They've just released Amanchu chapter 35, so maybe things will start to move eventually. Awww yeah. Every series is getting a BD and each set comes with one ep of Avvennire. The anime will consist of three episodes: the first episode is titled "Sono Aitakatta Anata ni..." (To You, Who I Wanted to Meet...), the second episode is titled "Sono Atataka na Sayonara wa..." (That Warm Goodbye...), and the third episode is titled "Sono Harukanaru Mirai e..." (To That Far Away Future...). The first two episodes are two stories from the original manga that were not previously adapted into anime. >Amano will also draw a completely new manga chapter that will serve as the basis for the story of Aria the Avvenire's third episode. If any of my old TL's(or new TL's) somehow read this, let me know if you want to do this. >The first episode's story starts with Ai practicing on the gondola with Akari. As they travel through a canal, they meet Aika and Alice. All three have not had much time to meet since becoming Prima undines. Considering even the little time they spend together a "miracle," Akari remembers a certain incident and relates it to Ai. I'm 99% sure this is Chapter 46 Birthday. >The second episode's story begins with Ai relating a story to Akari of her experiencing a "miracle" while she was practicing. She saw Cait Sith as she was traveling down an unfamiliar path. When she disembarks from her gondola to follow it, she meets two Single undines from Himeya company and Orange Planet in the middle of practice. This description makes it harder to figure out but I assume it's original content introducing the new Kouhais and a flashback. The flash back is most likely the final Cait Sith chapter since the episode title is "Sono Atataka na Sayonara wa..." (That Warm Goodbye...). Thanks for spotting that info! Caith Sith's presence in Aria the Avvenire is quite shocking, considering he was outright expelled from Origination, following the Naturale ep. 20-21 controversy. Maybe they are trying to change the nasty image anime presented of Caith Sith, by covering some manga chapters? Yet, I don't want the way too young Ai (family name not known) anywhere near that scary cat, it just feels sick for me. One would think Mrs. Amano got cured of her cat-mania following her childbirth and baby care? 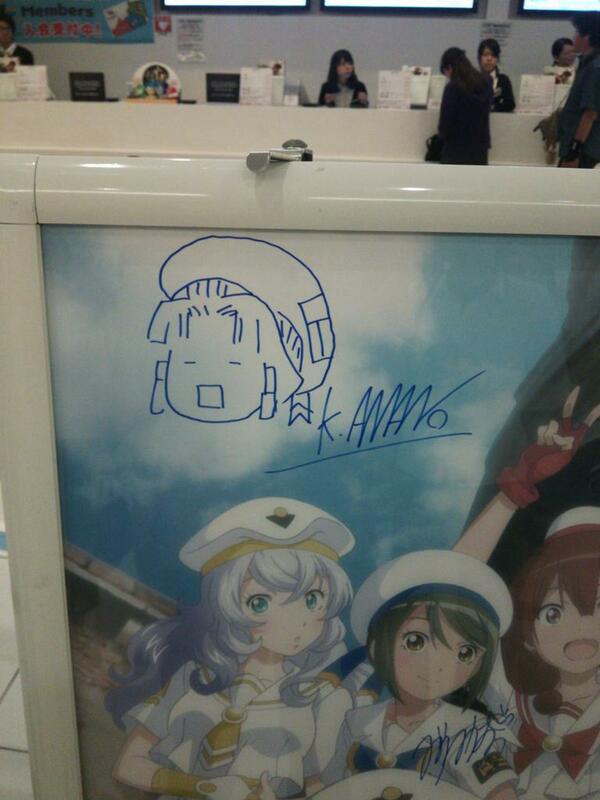 The new undine trainee faces have been snown, picture signed by K. Amano. As predicted, they are doing Birthday and the Cait Sith chapter, both have scenes previewed in new PV. My concern is who have seen only the Origination arc won't understand the Caith Sith story. Furthermore, that story covers the SEVEN wonders of Neo-Venezia, which should be enough to make a feature-lenght movie, not just an OVA. It's wasteful to expend it! Anohana's Menma VA will dub Anya Dosvidanya in Aria the Avvenire, which explains why she looks so pale... BTW, Menma was half-serbian, which is almost the same as a russian. Can you annotate who-is-who in this ARIA the Avvenire cast photo? I think we are used to much better OP / ED pieces in the ARIA franchise, KanColle or not. Frankly, this one doesn't even compare with the widely despised Aria the Naturale EDs (which I happen to like, anyhow). The next chapter is apparently due in early October 2015. Seems like it. Also seems like the new chapter will be available for purchase at the first Avvenire screening. How soon before a torrent is available for fansubbing? Blu-rays don't come out till late December, and that's only OVA 1. On a related note, if anyone who went and brought the promo book with the new chapter and can scan it, please let me know. 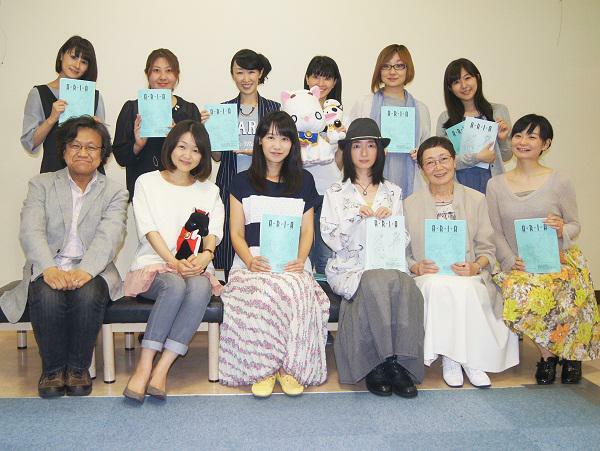 It appears Kozue Amano has a girl child. She posted a photo on Twitter. I think she should be more careful. Amanchu! chapter 64 is now available online on the publisher's website.